Pasteurised Iced Coffee with Sweeteners. Only 78 calories. I'm so light! A little piece of heaven and freshly roasted arabica coffee. Lactose free. Suitable for vegetarians. 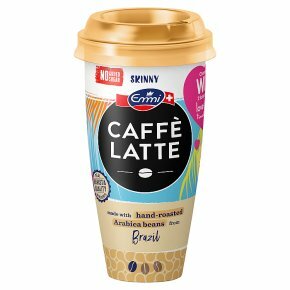 For all coffee lovers, Emmi Caffè Latte Skinny is the perfect refreshment. Enjoy the smooth taste of freshly brewed arabica coffee and milk, with no lactose and only 78 calories. Plus all our coffee beans are grown or Rainforest Alliance Certified? farms. Enjoy!